I had nurtured the idea of this blouse ever since I got hold on the April 2012 issue of Burda Style. A very simple blouse was something I needed to add to my wardrobe since I didn't have any. I generally dislike garments with buttons since I find them impractical. But when I started making my own clothes, the process forced me to reassess my not-so-tender feeling towards buttonholes. I bought both the fabric (cotton batiste) and bee-shaped buttons three years ago in Nippori Textile Town. For this blouse, I used slightly less than a metre (one yard) of fabric, some fusible interfacing for the collar and front placket, and four buttons. 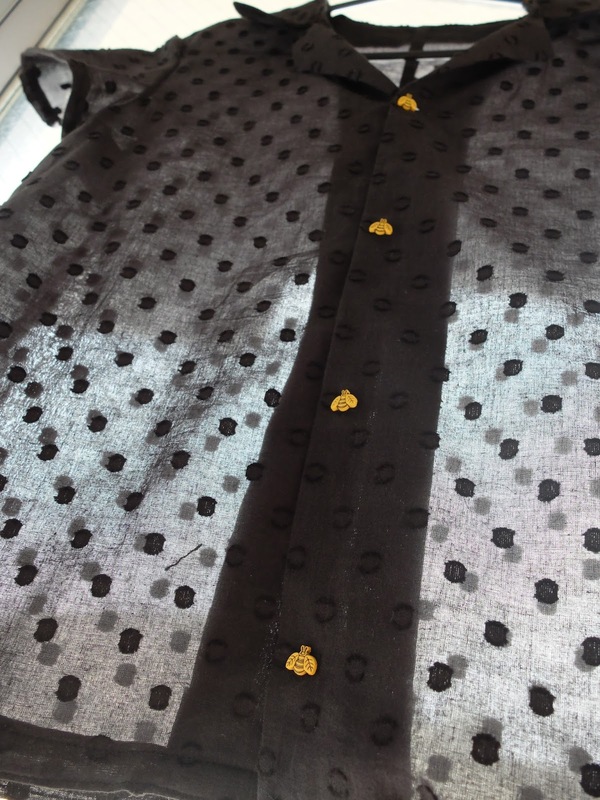 This cotton batiste is so delicate that I decided to finish the garment with French seams. Depending on the light ,the fabric can appear see-through or opaque. Honestly, I am not a prudish type; so if somebody wants to stare at my bra, I have no objection. Local girls here usually put one or even two extra layers underneath when wearing a see-through garment. But I don't mind, really. The pattern in Burda features a very short blouse which would be combined with high-waisted trousers or a skirt. Of course, I wanted to wear it with everything, so I added 7cm to the bodice which, I think, are not enough. When trying to strike fancy poses (like in the very first picture), you can still see my tummy. So I will add 5cm more to the next one (and there will be a few). At the same time, I did not judge it necessary to add another alteration for my back as I have started doing for other bodices lately. Since the blouse is not fitted and the fabric is so thin, I though it wouldn't do any harm to let it flow the way it it. The entire sewing experience was pretty short and enjoyable. The last touch to the garment, buttonholes, scared me. Besides my phobia of buttonholes, my sewing machine is not really great for making them. The only way to do so was by hand sewing. Also, don't forget that with very thin fabrics like batiste, machine-sewn buttonholes are a no-no! First, I cut each buttonhole 0.5mm smaller than the length of my actual buttons. Then, sewing with waxed silk thread (the one I have in my shop), I went around the buttonhole using a blanket stitch. For my buttonhole, which was 1cm, I needed 25-30cm of thread. As suggested in all sewing books, I started from the narrow end and sewed clockwise. The process was easy to execute but it took me some time to ensure the consistency of the stitches. Altogether, I spent an hour testing on scraps and maybe 30min to finish my four buttonholes. The last touch to the buttonholes was stitching tiny rectangles around each one to prevent them from fraying in the future. In my case, it was 7x3 stitches. I think they are pretty neat. I ended up enjoying hang-sewn buttonholes and I'd like to make more buttoned garments. The Internet did not turn up any results for a name for a phobia of making buttonholes :( Shall I invent my own term and name it "botonophobia"? What is your biggest fear in sewing? Ooh, this looks so airy and light! Really nice! Did you stabilize the buttonband before working the buttonholes? I've never done hand-worked buttonholes, so I'm curious about them! And a skirt (not a pencil skirt though) is on the way! And next blouse too :) Do you mean the September issue? P.S. You site still does not want to accept my comments :( But I am wondering, a castle on one of the pictures, isn't it a castle of the Sewing Princess? The entire placket is stabilized with some fusible interfacing. Maybe, I'll make a tutorial about hand-sewn buttonholes? I cannot agree with you more! Instead of avoiding those fears, just face them! By the way, thumbs up to your glorious obento! I don't (want to) cook and buy obento from supermarket. OH NO!!!! Since I am in process of making another shirt and a skirt, you encourage me to create a tutorial about zipper insertion and hand-sewn buttonholes! At the end, it's not that scary :) Do you also sew with knits? The shirt is lovely and the buttons are adorable! Japon seems to be full of cute items like that! I wish I could find a similar fabric, it is amazing! Your new homepage is so fantastic! I just love it. Your blouse is great too and yes, a tutorial on sewing button holes would be great. The button holes on my machine are a bit dodgey so it would be sensible sometimes to hand sew them. Biggest fear ? So many, but maybe bound button holes. Oh so lovely! Bastiste is delicious to wear in warmer times, and such a pretty raised pattern on it too. My favourite details is the cute little bee buttons though... and your fabulous yellow jeans! Awesome! BUttonholes certainly can be a pain, eh? But the finished shirt is totally worth it - lovely!